On September 8, 1900, the Galveston Hurricane killed more people than the combined death toll of all hurricanes which have struck since 1900. Although they knew four days before the hurricane made landfall, and despite the fact that there were official calls for evacuation, few people thought anything would happen to the Island of Galveston. People who had gathered in the fine hotel there, believing the building to be hurricane-proof, partied until the building fell to the ground. Founded in 1839, Galveston, Texas was the harbor where Spanish explorer Cabeza de Vaca was shipwrecked in 1528. He and his crew named it Isla de Malhado, which translates to "Isle of Doom." In 1816, the first European settlements there were organized by Louis-Michel Aury, a pirate from Paris, France who was appointed resident commissioner of Galveston Island, which was declared a port of the Republic of Mexico in that year, and from which he and his crew defended Mexico in its fight for independence from Spain. The famed pirate Jean Lafitte occupied the island for a few years, beginning in 1817, appointing himself the head of a pirate kingdom he named Campeche. In 1821, he and his pirates were removed from the island by the United States Navy. In 1825, because of its natural harbor in Galveston Bay, in the Gulf of Mexico, the Congress of Mexico again declared it a Mexican port, and it served as the capital of the Republic of Texas in 1836. In 1836, a group of businessmen from Canada bought a parcel of land on the island and founded the city of Galveston, and which would then found the first post office in Texas, as well as the first Catholic school, insurance company, Masonic order, and cotton compress in the state. Additionally, it was the first city to have gas lights. By 1890, the port of Galveston was rivaled only by the port of New Orleans, and it again held a string of "firsts" in the state, including the first telephone, electric lights, orphanage, and opera house. And by 1900, Galveston was a bustling port city with a population of 37,000, and the largest city in Texas. In late August of 1900, the main way storms were predicted was from reports of those on ships which put into port. On August 27, the first sighting of a tropical wave off the Windward Islands in the Antilles occurred. Three days later, it was reported as having been sighted in Antigua, and by September 1, 1900, there were reports of a severe tropical storm making its way toward Cuba, where it made landfall on September 3. As it moved north west, it was reported in Key West, and reports of major damage along the coasts of Louisiana and of Mississippi began pouring in. Communications were largely crippled, due to damage to Samuel Morse's newly-created telegraph system, but on September 7, the Weather Bureau in Washington, D.C. ordered storm warnings from Pensacola, Florida to Galveston. The Galveston Weather Bureau issued a full-blown hurricane warning, and at 1:00 in the afternoon the ship Louisiana docked, and the captain estimated the wind speeds of the storm he had just passed through at 100 mph. By 5:00 on Saturday, September 8 the office was recording hurricane force winds. It's hard to say why most of the residents of Galveston did not heed the warnings. Galveston sat on a low, flat island which was really not much more than a big sandbar, and the highest point on the island was a mere 8.7 feet above sea level. There had been numerous proposals for construction of a seawall, particularly given the hurricanes of 1875 and 1886, both of which demolished nearby Indianola. Local government, as well as a majority of the city's residents, ridiculed them and dismissed their proposals. Galveston's own Weather Bureau section director wrote an article in a 1891 article in the Galveston Daily News, in which he asserted that a seawall was not needed, and that it would be impossible for any significant hurricane to reach the island. After all, Galveston had been blessed, having survived numerous storms with no problems, and residents were lulled into a sense of complacency. By midmorning on September 8, the wind had picked up speed and rain clouds rolled in quickly, and the high tide flooded some of the streets in town. That in itself was not unusual, given the elevation -- or lack thereof -- of the island city. 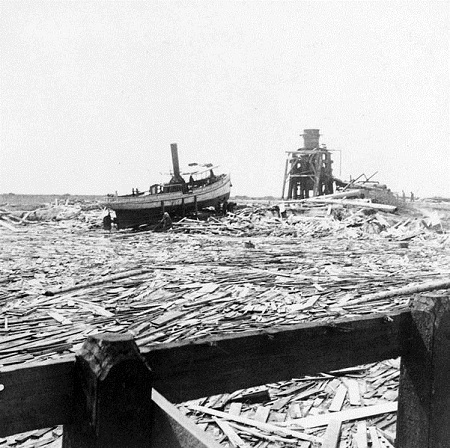 By 2:00 in the afternoon, the hurricane began to pummel Galveston. By 6:00, wind gusts were easily 100 mph -- though the official instruments of the Weather Bureau were blown away just after the 100 mph speed was recorded. It was the equivalent of the modern-day Category 4 hurricane. The storm surge was more than 15 feet, so buildings were knocked off their foundations entirely. Only some of the Strand District mansions survived, though virtually every building on the island was damaged. The eye of the hurricane passed over the city around 8:00 that night, while the hurricane winds continued to batter the harbor and the island for at least four more hours, leaving shredded bridges, ships, buildings, and streets in its wake. There was no way off the island, so those who were on the mainland had no idea of the amount of damage and destruction which had befallen Galvenston. By 9:30 that night, more than a thousand island residents had taken refuge in the sturdy Tremont House Hotel. Many of them had drowned as they tried to reach the hotel in the shoulder-deep water in the streets, carried off to drown in deeper water. The dome of the hotel had been carried away, and those who had managed to make it to the hotel were terrified with each howling wind that they too would be carried away. Some time between 10:00 and 11:00 that night, the storm passed and the water quickly receded. The streets were no longer underwater by Sunday morning, but most people were unaware that the streets were littered with the 8,000 people who had died during the night. Nor did they realize that the town was all but destroyed, with few buildings still standing. By Sunday afternoon, looters had begun robbing the dead, and the Galveston men who had been deputized to keep order were ordered to kill anyone found plundering the dead. Further, they were ordered, "Make no report" of those who were killed looting. Reports are that "many" were killed in this manner, but no official record exists of how many. Also that morning, the Galveston News published a single-sheet edition of the newspaper, which stated "Following is list of dead as accurately as News men have been ale to make it. Those who have lost relatives should report same at News office. This list will be corrected and added to as returns come in." After that was a two-column list of names of the dead. On Tuesday, martial law was decreed, and while the women and children were allowed to leave the city, the men were requested to stay and help in the removal of the dead, at first sent out to on barges to be buried there at sea. When, however, the bodies began to float ashore. Mass cremations were done, and the funeral pyres burned into November, with bodies washing ashore until well into February. On September 17, 78-year-old Clara Barton, founder of the American Red Cross, headed up a contingent of workers who distributed food and clothing from, leaving on November 14; and donations came in at a robust pace, from all over the country: churches in Georgia, New York City millionaires, religious groups, and thousands of people who were moved to help out, including a young girl in Chicago who sent a dime. More than $1.25 million was raised and delivered from Texas, Illinois, Massachusetts, and Missouri as well as Canada, France, Mexico, Germany, England, and South Africa. In 1902, a hurricane wall was erected, three miles long, 15 feet thick at the base, 5 feet thick at the top, and 17 feet above mean low tide, with the pilings going 40 to 50 feet deep. In 1903, dredged sand was brought in to raise the island to more than 15 feet above its previous level. Today, Galveston thrives on tourism and ranks 7th out of 13 major Texas ports. It also is the location for the University of Texas Medical Branch and has survived several subsequent hurricanes. The Rosenberg Library's section dedicated to the history of the storm shares photographs, manuscripts and oral history. Additionally shows a list of recorded death, and a map. The Weather Channel hosts this section, which is about the deadliest hurricane in the history of the United States. Also available here are photographs of the aftermath as well as video. Contains memories of those who in Galveston the night of the hurricane, newspaper stories, and photographs as well as details about the tragedy of the orphanage, the rebuilding of the city, and photographs and film clips. First-hand reports of the storm, what it was like at the party, and the aftermath of the disaster. Also displays photographs of the damage. Search for Galveston Hurricane of 1900 on Google, Bing, or Yahoo!